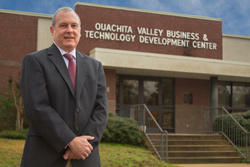 James Lee Silliman is Executive Director for the Ouachita Partnership for Economic Development / Camden, Arkansas. CAMDEN, ARKANSAS JOB FAIR - If you’re looking for a job or maybe considering a career change, there’s a huge job-fair taking place in Southern Arkansas this Tuesday. Billed as “Plug-In / Power Up For Camden Job Success” – the Ouachita Partnership for Economic Development and City of Camden will be holding a job fair at the Southern Arkansas University Tech Campus in Camden, Arkansas. James Lee Silliman Executive Director for the Partnership explains more. industries in Highland Industrial Park. They are being awarded new defense department contracts." CAMDEN, ARKANSAS JOB FAIR - If you’re looking for a job or maybe considering a career change, there’s a huge job-fair taking place in Southern Arkansas this Tuesday.